Odor problems can be as serious as a gas leak or as simple as a dirty air filter. But keep in mind, a good mechanic doesn't just use his hands. He uses his ears and nose - all his senses. 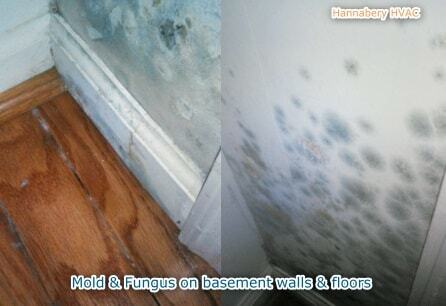 Unusual odors can indicate a serious problem and should not, I repeat, should not be ignored! Otherwise, there are many different types of odors and different causes, but for the most part they can be broken down into the five different categories listed below. Electrical odors are usually caused by parts overheating. Indoor blower motors are a common example. If there is a mechanical failure; such as the bearings seizing up, then the motor over-heats and the insulation on the wires and the motor windings themselves start to melt, causing the odor. Sometimes, loose electrical connections can cause wires or relays to overheat, causing electrical odors. It's also possible for a very dirty air filter to cause the odor. 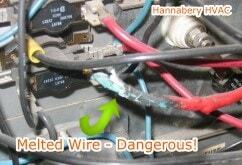 If the airflow is restricted enough, it could cause electric resistance heaters to overheat, even burn-out. If you smell an electrical odor, check your air filter. If it is not blocked, shut the equipment off at the breaker if possible, and call for service. This is similar to an electrical odor only worse. It is also sometimes accompanied by smoke. Once again, this can be caused by parts or wiring burning-up. It can also be debri such as plastic getting into the ductwork and melting on the electric resistance heaters or heat exchanger. If you smell a burning odor, check your air filter. If it is not blocked, shut the equipment off at the breaker if possible, and call for service. First of all, if you really smell gas and suspect a gas leak, you should open the windows and get out of the house immediately. Then call the gas company. Now excluding that "worse-case" scenario, if you notice an odor that smells like gas and it seems to be coming out of the supply vents, it usually isn't gas. Sometimes dust that settles on the heat exchanger during the summer months burns off at the beginning of each heating season, and it smell just like gas. If the odor doesn't seem to be coming from the vents, try to pinpoint where the smell is coming from. Use your nose. If it is gas, it usually would be from a leak in a pipe fitting or at the equipment itself. Gas odor is the one that causes the most fear. People think of gas explosions or carbon-monoxide poisoning. Well, gas explosions are very rare and carbon-monoxide for the most part is odorless. Having said that though, don't take a gas odor lightly. If you can't locate the source of the odor and you are worried you have a gas leak, remember, open the windows, get out of the house, then call the gas company. Oil odors are usually caused by one of two things. 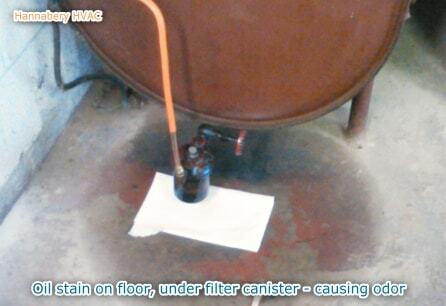 An oil leak/drip or an oil burner that is not working properly. The oil leak is usually easy to spot. Just look for oil. Check the burner itself, the oil tank, filter and oil line. Sometimes it is just a matter of tightening a fitting. If there are no signs of an oil leak then it is most likely a burner problem. This can be caused by many things, too many to list actually. It could be a minor adjustment to the burner, to a faulty or blocked chimney. From a bad fuel pump, to a plugged oil nozzle. Listen for any unusual rumbling or banging sounds, and look for any smoke or soot while the burner is running. If you notice any of these things and/or you have an oil odor, you should call for service immediately. One other common problem today is that new houses are insulated so well and are built so tight that they run out of combustion air, causing odor problems. In this case it is just a matter of bringing in a fresh air for the burner. 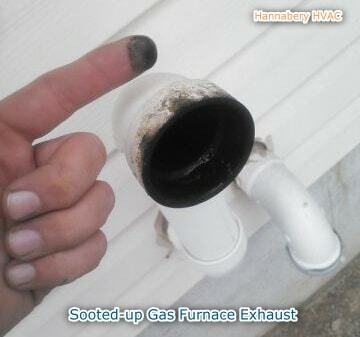 Call Hannabery HVAC or your local Heating Company to assist in a proper diagnosis. This is more common in the air conditioning mode during the summer months, but this odor problem is almost never due to a problem with your equipment. It's usually related to water getting into the house from another source. Sometimes attic units or very damp basements have this problem. Check for air leaks in the return ducts. Check for water damage to the ducts or air handler itself. Possibly consider having your ducts cleaned. Run a dehumidifier and see if the odor goes away. Keep in mind that almost all heating systems cause an odor the first time they are fired-up, and the first few times at the beginning of each heating season. Brand new furnaces are coated with oil to keep the heat exchangers from rusting; this burns off, creating a bad odor - even smoke. But it usually only lasts for about 20 minutes. Opening the windows usually solves the problem. And the first few times the backup heat on a heat pump kicks on - each heating season, it can give off a dusty, electrical odor. This might last for a few days but isn't that bad. If you are worried, call for service. Remember to check for a clean air filter and that your vents are opened. Check to see if the fan is working, which mean your motor hasn't burned-up. Check for air leaks in damp areas, oil stains or rumbling sounds, strong gas odors - these all indicate problems. Do not ignore them. Seriously, don't!